Lancaster County printers have often been colorful characters. Herman Villee is no exception. Herman Wilhelm DeVille was born in Paris in 1789, where his father was the city's governor. Herman became an influential attorney in Paris. He also became a soldier, and fought in Napoleon's army at Austerlitz and Moscow. Herman emigrated to the U.S. in 1820. Here he changed his name from DeVille to Villee. In 1826 he started a Lancaster newspaper with Jacob Baab. The newspaper was Der Lancaster Adler (The Lancaster Eagle). Villee was fluent in French, German, Italian and Spanish. He was a member of the German Reformed Church, and was a personal friend of Lancaster's own future U.S. President James Buchanan. In the 1830s, Herman moved to Northumberland County, where he continued printing, in addition to being a school teacher and tavern keeper. His beer probably sold better than his broadsides. Herman was not the world's most successful printer. But he was Lancaster's only Napoleonic, silver-spurred printer, so I figured I better include him here. 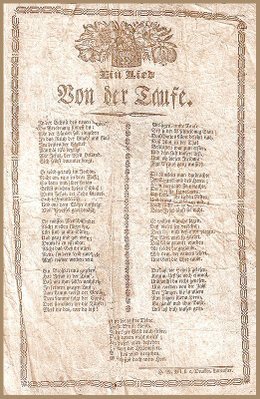 Above: Poetischer Himmelsweg (Poetic Way to Heaven) Printed by Herman Villee. Rev. 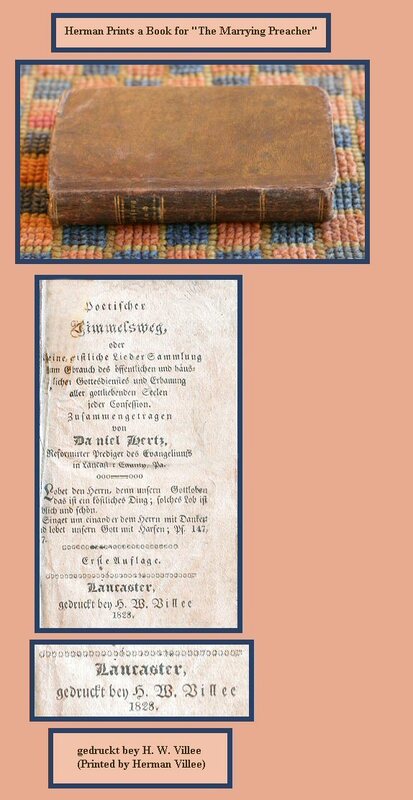 Hertz published this collection of hymns in 1828. Two years later he organized a congregation at Heller's Church (Salem Church) near Mechanicsburg, PA, where he served for 37 years. During this time, Rev. 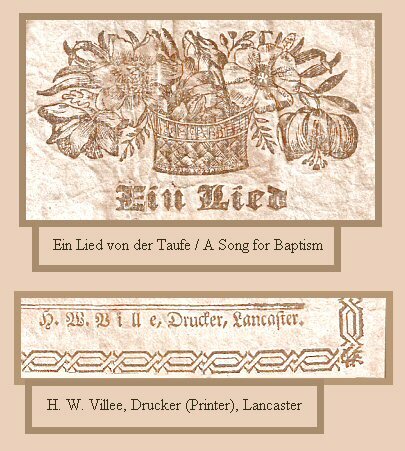 Hertz conducted German Reformed weddings all over Southeast Pennsylvania: at Ephrata, Muddy Creek, New Holland, Zion, Kissel Hill, Seldenrich, etc. Marrying brides was fun. Baptizing screaming babies was not so fun.